The Case-Shiller house price indexes for January were released yesterday. Zillow forecasts Case-Shiller a month early, and I like to check the Zillow forecasts since they have been pretty close. The continuing inventory pinch helped boost the U.S. national Case Shiller index 6.2 percent in January from a year earlier, down from a 6.3 percent gain in December. Case-Shiller’s 10-City Composite rose 6 percent, while the 20-City Composite climbed 6.4 percent year-over-year. Spring home shopping season will be in full swing soon, and with it we can expect the usual seasonal bump of would-be home buyers competing over a shrinking pool of homes. But in a twist, this year’s buyers may be competing against some buyers who have been unsuccessful in recent months. Increasingly, the traditional seasonal boundaries around home shopping season – which generally heats up in early spring and cools off by late summer, in time for back-to-school season – are becoming less pronounced. Limited supply, fierce competition and rising prices are forcing many buyers to stay on the market longer in hopes of finding the right home at the right price. More inventory is really the only cure for those pressures right now, especially for people at the entry-level end of the market, but it has proven frustratingly slow in coming. Right now, the market can barely absorb what current demand there is. It remains to be seen how it adapts to even more buyers, and presumably less inventory, in the months to come. Zillow predicts the February S&P/Case-Shiller U.S. national index, released April 24, will climb 6 percent year-over year. 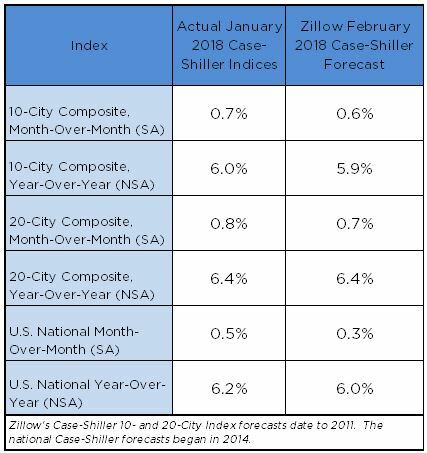 The Zillow forecast is for the year-over-year change for the Case-Shiller National index to be slightly less in February than in January.